Rewind. It was May 2nd, 2016 and we just got back from the most incredible day of fishing out on a small dinghy in the middle of the Lyngen Alps. Vibes were strong, the sun was out, epic fjords were in the distance and a couple of us were sitting on the back of a Lagoon 450 catamaran named ‘The Arctic Princess’ - we were talking about what fuels our fire, what we enjoy doing in our spare time and most importantly what about the environment are you most passionate about. Tom answered the ocean, Anton answered the ocean and I thought to myself well, the glaciers, mountains (which are directly related to the ocean), but the first thing that popped into my head were the animals. Huge mammals that are whimsical, romantic, and mysterious. Animals whose beauty is truly not comprehendible. Whales, elephants, giraffes, the creatures you dream about seeing as a child. Though I have been fortunate enough to go to sleep away zoo camp where I fed the giraffes and silver back gorillas as a child, it is rather sad to see the risk and danger we are putting our earthly co-habitants in BUT there are thousands of people making the world a better place with incredible progress (which is the part where I like to look at things with the glass half full). Since moving to the Arctic, I have been challenged by different thoughts on how to make a positive impact in the world. A lot of people are complaining about how our world is doomed, the environment is screwed, blah blah blah go watch a documentary if you want to hear about all of that, but there does not seem to be much action, particularly from people like myself… honestly put, a consumer. I buy a coffee nearly every day, I have been in an airplane for 238 hours this year, flying around the world nearly 1.5 times, I throw my garbage away like mostly everyone else (three cheers to Norway for properly disposing of their garbage), I rent cars, take trains, consume and purchase more food than I need, I think you get it. Though I started doing the small stuff like bringing my own bag to the grocery store (big deal for an American who usually consumes 10 plastic bags per transaction), and neutralizing my carbon emissions through Chooose there are plenty of other fun things to do just if the time is allocated. So the Pukka Travels team started thinking about what exactly those things are. We wanted to do something more, something that sparked change within someone along with bringing a community together to feel like they were really part of something. As you may have read or watched Pukka Travels ended up hosting an ocean clean up where the community of tour operators, students and locals came together and cleaned the beaches surrounding Tromsø. While you can read about the day here, I wanted to write a post about how easy it is to do something in your local community to make a difference for both yourself, and something you are passionate about (in my case, I love animals and want to make sure we do not pollute their home along with keeping our beautiful landscapes clean as well). 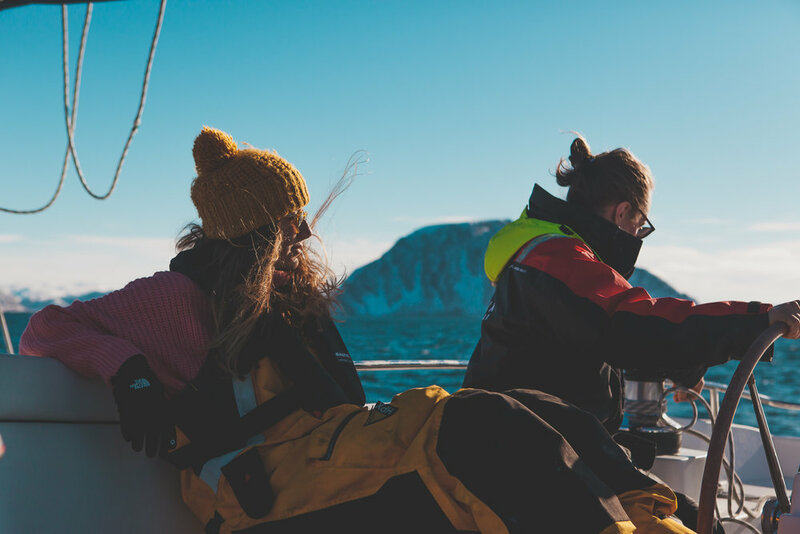 When living on an island in the Arctic, and working for a company in which sailing is our main product, cleaning the ocean is the obvious first step and choice to start. It was shocking to see that 50 people cleaned up 1400kg of ocean garbage in just a couple of hours. English, Norwegian, Russian, French, German bottles flooded the coastline and now it is all gone. While the garbage may end up in a landfill, or burned into thin air it's better there than in the stomach of a whale, bird or around the neck of a sea turtle. Long story short, help the planet out by helping out where you are most passionate. It will all add up.